What Is the Difference Between a Cockatiel & a Cockatoo? Some species of cockatoo, such as the sulpher-crested cockatoo, are very large when compared to cockatiels. The cockatiel is a specific species within the bird family commonly called cockatoo. There are 21 species of cockatoos within the family of birds Cacatuidae, and cockatiels are the only members of the Nymphicus genus. Cockatiels are the smallest birds in the cockatoo family and are one of the most popular pet birds. All cockatoos, and therefore all cockatiels, are members of the order Psittaciformes (parrots). The most obvious way to discern a cockatiel from other cockatoos is the size difference. Cockatiels are about half the size of other cockatoos and have much smaller beaks. In the wild, cockatiels are gray with yellow and orange faces, although some variations of color exist and are more common in captivity. Most cockatoos are solid white or black, but some have yellow, red and pink as well. In all cockatoos, which includes the cockatiel, color variations exist according to gender, with males being more brightly colored. Some species of cockatoo can live more than 100 years, while cockatiels have an average lifespan of about 14 years in captivity and 25 years in the wild. A pet cockatiel that receives excellent care has the potential of living into his 20s. Cockatiels are generally calmer and easier to keep than other cockatoos. Large cockatoos require larger cages and more playtime outside the cage to remain stimulated enough to be mentally healthy and happy. For kids or beginner bird owners, a cockatiel is more ideal, which is why it's arguably the most popular pet bird. As members of the parrot order, cockatoos and cockatiels may also mimic human speech if trained and kept as a pet from a young age. Cockatiels are the most popular cockatoos available as pets and are bred in captivity for that purpose. 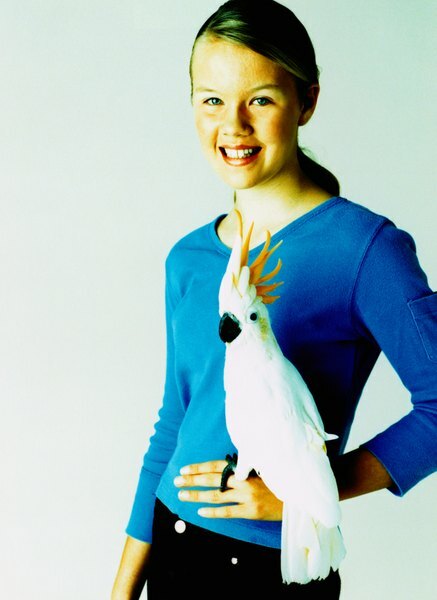 Catching wild birds in Australia, where cockatoos and cockatiels are native, is strictly prohibited. 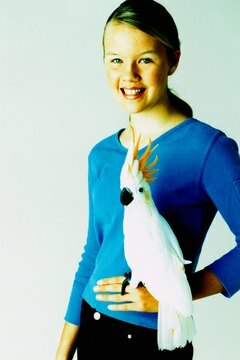 Aside from cockatiels, the most popular larger cockatoo species available as pets include the moluccan, umbrella, and sulphur-crested cockatoos. Are Parakeets & Cockatiels Related? What Is the Origin of the Cockatoo?